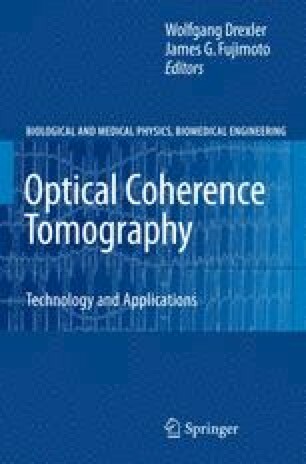 Optical coherence tomography (OCT) achieves very high axial image resolutions independent of focusing conditions, because the axial and transverse resolution are determined independently by different physical mechanisms. This implies that axial OCT resolution can be enhanced using broad bandwidth, low coherence length light sources. The light source not only determines axial OCT resolution via its bandwidth and central emission wavelength, but also determines the penetration in the sample (biological tissue), the contrast of the tomogram and OCT transverse resolution. A minimum output power with low amplitude noise is also necessary to enable high sensitivity and high speed — real time — OCT imaging. Furthermore, ultrabroad bandwidth light sources emitting at different wavelength regions might also enable a potential extension of OCT, e.g., spectroscopic OCT. Hence, it is obvious that the light source is the key technological parameter for an OCT system and proper choice is imperative .